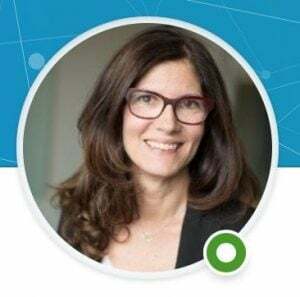 Joan Bohan is a finance executive at Disney France. Joan found our book, The Dyslexic Advantage and the Dyslexic Advantage community after discovering that her son was dyslexic. Over the past few years, it’s been exciting to hear how she was able to spearhead positive dyslexia awareness throughout the Disney Corporation and in so doing, make one of the world’s beloved children’s media creators dyslexia-friendly! Two years ago, Joan pitched her ideas about dyslexia to the European Leadership group at Disney and look at what has already happened! 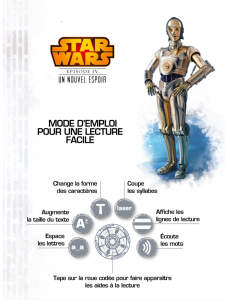 The “I like reading DYS” series of innovative ebooks that include dyslexia-friendly fonts, layout, and audio tracking customized for young French and Dutch dyslexic readers. In the Netherlands, the publisher Zwijsen launched an Easy Reading with Disney series that simplified syntax, fonts and layouts especially for 8-12 year old dyslexic readers. Hachette also developed a dyslexia-friendly range of books as part of the “I’m learning to read” collection for beginners. Upfront, the Book provides useful information such as characters’ names and pictures, color coding for similar sounds and recurring words. 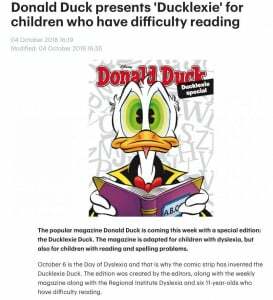 The multimedia company Sanoma also launched a special Dyslexia-Friendly comic special in October in Donald Duck magazine for Dyslexa Awareness month. 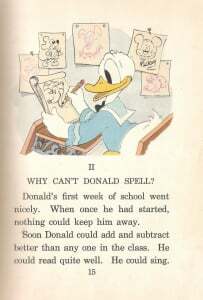 I had told Joan that one of our Dyslexic Advantage Board members, Tanya Wojtowych had told me about how she had come across a vintage story about Donald Duck where he was good at drawing and math, but had trouble with spelling (see below). It was neat to hear that Ducklexie team planned the magazine with the help of a team 11 year old ‘experts’ who have challenges with reading. Read Joan’s blog post on dyslexia HERE.